Bert: Bert'll take care of you, just like I was your own father. Now who's after you? George Banks: I suggest you have this piano repaired. When I sit down to an instrument, I like to have it in tune. Mrs. Banks: But, George, you don't play. Mary Poppins: In every job that must be done, there is an element of fun. You find the fun, and - SNAP - the job's a game! Bert: What did I tell ya? There's the whole world at your feet. And who gets to see it but the birds, the stars, and the chimney sweeps. Mrs. Banks: But you're always saying that you wanted a cheerful and pleasant household. Mr. Banks: Winifred, I should like to make a slight differentiation between the word cheerful and just plain giddy irresponsibility. Mr. Dawes Sr.: If you invest your tuppence wisely in the bank, safe and sound, soon that tuppence, safely invested in the bank, will compound! And you'll achieve that sense of conquest, as your affluence expands! In the hands of the directors, who invest as propriety demands! Mrs. Banks: [singing] Our daughters' daughters will adore us and they'll sing in grateful chorus, "Well done, sister suffragettes." Bert: Goodbye, Mary Poppins, don't stay away too long. Mrs. Banks: I'll try to do better next time. Mr. Banks: Next time? My dear, you've engaged six nannies in the last four months. And they've all been unqualified disasters. Admiral Boom: [seeing the chimney sweeps dancing on the rooftops] We're being attacked by hottentots! Bert: [about his chalk drawings] Not Royal Academy, I suppose. Still better than a finger in the eye, ain't they? George Banks: [Going to see the bank] Remember that the bank is a quiet and decorous place, and we must be on our best behavior. George Banks: Yes, well, I'm one of the junior officers, so in a sense it is. Sort of. Bert: Now this im-posin' edifice what first meets the eye is the 'ome of Admiral Boom, late of His Majesty's Navy. Likes his house ship-shape, he does. Shipe-shape and Bristol fashion at all times! Bert: What he's famous for is punctuality. The whole world takes its time from Greenwich, but Greenwich, they say, takes its time from Admiral Boom. Bert: Number 17. Got some parties 'ere in town what wants to see it. Admiral Boom: [to Binnacle] Enter that in the log. Admiral Boom: A word of advice, young man: storm signals are up at number 17. Bit of heavy weather brewing there. Bert: Thanks, sir. Keep an eye skinned. Bert: Here we are, 17 Cherry Tree Lane, home of George Banks Esquire. Bert: 'Ello, 'ello, 'ello! Admiral's right: heavy weather brewin' at number 17 and no mistake. Admiral Boom: [observing the queue of prospective nannies] Ghastly looking crew, I must say! Mr. Dawes Sr.: While stand the banks of England, England stands - whoa, whoa...! Mr. Dawes Sr.: When fall the banks of England... ENGLAND FALLS! Mr. Dawes Jr: In 1773, an official of this bank unwisely loaned a large sum of money to finance a shipment of tea to the American colonies. Do you know what happened? George W. Banks: Yes, sir. Yes, I think I do. As the ship lay anchored in Boston Harbor, a party of the colonists dressed as red Indians boarded the vessel, behaved very rudely, and threw all the tea overboard. This made the tea unsuitable for drinking. Even for Americans. Mr. Dawes Sr.: From that time to this, sir, there has not been a run on this bank - UNTIL TODAY. A run, sir, caused by the disgraceful conduct of your son. Do you deny it? George W. Banks: I do not deny it, sir, and I shall gladly assume responsibility for my son. Mrs. Banks: [sees the time] Excuse me, POSTS, EVERYONE, PLEASE! George Banks: [singing] A British bank is run with precision. A British home requires nothing less! Tradition, discipline, and rules must be the tools! Without them: disorder, catastrophe! Anarchy! In short, you have a ghastly mess! Horse: [also saluting] Oh, yes, definitely. A view halloo. Fox: Faith and begora, 'tis them Redcoats again! Old Crone: [seeing Jane and Michael running in the alley] Come with me, m'dears! Granny'll 'ide you! Bert: [Laughs while taking a tissue from his pocket] It's just good clean soot, Michael. Bert: [Surprised] What? No road? Bert: [Looking at viewers, breaking the fourth wall] Oh, It's you. Hello. [Pauses, as if the viewer asks him for the house address] Number 17 Cherry Tree Lane, you say? Alright. [Puts his hat back on] Come on with me. Jane: [Sadly] Father? In a cage? Jane: [Sadly] Michael, be quiet. And Bert, do you think father really needs our help? George Banks: Ellen, stop making that offensive noise. And shut the window. That bird is giving me a headache. Ellen: Yes, Sir. [to the bird] Quiet! You're giving the master an 'eadache. Admiral Boom: Glorious day, Mr. Binnacle! Glorious! No one sleeps this morning. Put in a double charge of powder. Mr. Binnacle: A double charge? Aye aye sir! Admiral Boom: Shake things up a bit, what? Mr. Banks: What's all this? What's all this? What's all this? What's all this? Constable Jones: [on phone] That's what I said, sir. Go fly a kite! Constable Jones: Well, no, sir, no. I didn't mean you personally. Mary Poppins: [as Jane and Michael run down the path in the chalk drawing] Don't fall and smudge the drawing! Poppins: you don't fool me a bit! Katie Nanna: I said my say, and that's all I'll say. I've done with this house forever. Mrs. Clara Brill: Well, hip-hip-hooray! And don't stumble on the way out, dearie. Mary Poppins: Never judge things by their appearance... even carpetbags. I'm sure I never do. Lady in the Bank: There's something wrong, the bank won't give someone their money. Depositor: Well, I'm going to get mine. Come along, young man, every penny! Mr. Dawes Sr.: [snatching Michael's tuppence away] Welcome to our joyful family of investors! Mr. Banks: You see, Michael, you'll be part of Railways through Africa. Mr. Banks: Dams across the Nile. Mr. Dawes Sr.: The ships, tell them about the ships. Mr. Banks: Fleets of ocean greyhounds. Mr. Dawes Sr.: More, tell them more! Mr. Banks: Majestic self-amortizing canals. Mr. Dawes Sr.: Oh, it fires the imagination! Mr. Banks, Mr. Dawes Sr., Mr. Dawes Jr, Mr. Tomes, Mr. Mousley, Mr. Grubbs: [singing] In the Dawes, Tomes, Mousley, Grubbs, Fidelity Fiduciary Bank. Mary Poppins: [singing] Stay awake, don't rest your head. Don't lie down upon your bed. While the moon drifts in the skies... Stay awake, don't close your eyes. Though the world is fast asleep, though your pillow's soft and deep, you're not sleepy as you seem; stay awake, don't nod and dream... Stay awake... don't nod... and... dream. Mary Poppins: People who get their feet wet must learn to take their medicine. Michael: I don't like the sound of that. Mary Poppins: Otherwise titled Let's Tidy up the Nursery. Mr. Banks: [singing] I feel a surge of deep satisfaction, much as a king astride his noble steed. Mr. Banks: When I return from daily strife, to hearth and wife, how pleasant is the life I lead! Mr. Banks: Yes, yes, yes. Mr. Banks: I run my home precisely on schedule. At 6:01, I march through my door. My slippers, sherry, and pipe are due at 6:02. Consistent is the life I lead! Mr. Banks: It's grand to be an Englishman in 1910! King Edward's on the throne, it's the age of men! I'm the lord of my castle, the sovereign, the liege! Mr. Banks: I treat my subjects, servants, children, wife with a firm but gentle hand, noblesse oblige. Mr. Banks: It's 6:03, and the heirs to my dominion are scrubbed and tubbed, and adequately fed. And so I'll pat them on the head, and send them off to bed. Ah, lordly is the life I lead! Mr. Banks: Winifred, where are the children? Jane: Mary Poppins, we won't let you go! Mary Poppins: Go? What on earth are you talking about? Michael: Didn't you get sacked? Mary Poppins: Sacked? Certainly not. I am never sacked! Mary Poppins: Neither am I a Maypole. Kindly stop spinning about me. Mary Poppins: As I expected. "Mary Poppins, practically perfect in every way." Mary Poppins: [singing] Chim Chiminy, Chim Chiminy, Chim Chim Chiree! When you're with a 'sweep, you're in glad company. Bert: You're a man of high position, esteemed by your peers. Bert: Say no more, Gov'ner. Bert: You've got to grind, grind, grind at that grindstone... Though childhood slips like sand through a sieve... And all too soon they've up and grown, and then they've flown... And it's too late for you to give - just that spoonful of sugar to 'elp the medicine go down - medicine go dow-wown, medicine go down. Bert: Well, goodbye, Gov'ner. Sorry to trouble you. Ellen: Quiet! You're giving the master a headache! Bert: ...charming! Cynthia's dashing, Vivian's sweet! Stephanie's smashing, Priscilla's a treat. Bert: ...convivial company, time and again. Dorcas and Phyllis and Glynis are sorts I will agree are three jolly good sports, but cream of the crop, tip of the top - It's Mary Poppins, and there we stop! Mrs. Banks: [singing] We're clearly soldiers in petticoats, and dauntless crusaders for women's a-votes! Though we adore men individually, we agree that as a group they're rather stupid. Bert: You know, begging your pardon, but the one my heart goes out to is your father. There he is in that cold, heartless bank day after day, hemmed in by mounds of cold, heartless money. I don't like to see any living thing caged up. Bert: They makes cages in all sizes and shapes, you know. Bank-shaped, some of 'em, carpets and all. Mary Poppins: [singing] Early each day to the steps of St. Paul's, the little old bird woman comes... In her own special way to the people she calls, come buy my bags full of crumbs. Come feed the little birds, show them you care, and you'll be glad if you do. Their young ones are hungry, their nests are so bare; all it takes is tuppence from you. Feed the birds, tuppence a bag. Tuppence, tuppence, tuppence a bag... Feed the birds, that's what she cries, while overhead her birds fill the skies. All around the cathedral the saints and apostles look down as she sells her wares. Although you can't see it, you know they are smiling each time someone shows that he cares. Though her words are simple and few, listen, listen, she's calling to you. Feed the birds, tuppence a bag. Tuppence, tuppence, tuppence a bag. Though her words are simple and few, listen, listen she's calling to you. Feed the birds, tuppence a bag. Tuppence, tuppence, tuppence a bag. 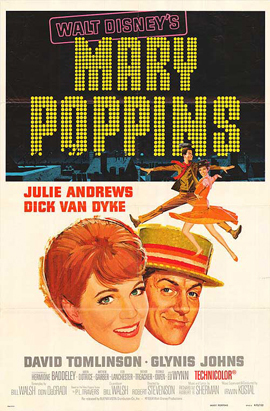 Mary Poppins: You know, you can say it backwards, which is "docious-ali-expi-istic-fragil-cali-rupus" - but that's going a bit too far, don't you think? Mary Poppins: You are the father of Jane and Michael Banks, are you not? Mary Poppins: I said, you are the father of Jane and Michael Banks. Mr. Banks: Well, really - yes, of course. And you brought your references, I presume; may I see them? Mr. Banks: Is that so? We'll have to see about that one then, won't we? Mary Poppins: Now the, the qualifications... item one: a cheery disposition. I am never cross. Item two: rosy cheeks... obviously. Item three: play games, all sorts. Well, I'm sure the children'll find my games extremely diverting. Mr. Banks: Now this paper, where did you get it from? I - I thought I tore it up. Mary Poppins: Excuse me. Item four: you must be kind. I am kind, but extremely firm. Mary Poppins: Have you lost something. Mary Poppins: [singing] He traveled all around the world, and everywhere he went, he'd use his word, and all would say, "There goes a clever gent!" Bert: [singing] When dukes or maharajahs pass the time o' day wi' me, I say me special word and then they ask me out to tea! Mr. Dawes Sr.: Well, do you have anything to say, Banks? Mr. Dawes Sr.: Confound it, Banks! I said do you have anything to say? George Banks: Supercallifragilisticexpialidocious! Mary Poppins was right, it's extraordinary! It does make you feel better! Hee hee hee hee! Mr. Dawes Sr.: What are you talking about, man? There's no such word! George Banks: Oh yes! It is a word! A perfectly good word! Actually, do you know what there's no such thing as? It turns out, with due respect, when all is said and done, that there's no such thing as you! Bert: It's easy! Let's see... You think. Bert: You do a double blink. Bert: You close your eyes... and jump! Mary Poppins: Close your mouth, please, Michael. We are not a codfish. George Banks: Yes, well done! You said it! George W. Banks: [grumbles] 'Morning. Jane: Mary Poppins taught us the most wonderful word! George W. Banks: What on Earth are you talking about, supercal... super... or whatever the infernal thing is? Mr. Dawes Jr: Ah, there you are, Banks. I want to congratulate you. Capital bit of humor, wooden leg named Smith! Mr. Dawes Jr: Or, Jones, whatever it was. Father died laughing! George Banks: Oh, I'm so sorry, sir! Mr. Dawes Jr: Oh no, nonsense, nothing to be sorry about! Never seen him happier in his life. He left an opening for a new partner. George Banks: Oh thank you, sir, thank you very much indeed! Uncle Albert: There is a way. And frankly, I don't like to think of it, because you have to think of something sad. Mary Poppins: Then do get on with it, please. Uncle Albert: Let me see... I have the very thing: Yesterday, when the lady next door answered the door, there was a man there, and the man said to the lady, "I'm terribly sorry, I just ran over your cat." Jane: Oh, that is sad. Uncle Albert: And the man said, "I'd like to replace your cat." And the lady said, "That's all right with me, but how are you with catching mice?" Mrs. Banks: I'm sorry, dear, but when I chose Katie Nana, I thought she would be firm with the children. She looked so solemn and cross. Mary Poppins: [singing] Just a spoonful of sugar helps the medicine go down, the medicine go down, the medicine go down. Just a spoonful of sugar helps the medicine go down, in the most delightful way. Bert: He stands about all day... and makes faces! Bert: All right, ladies an' gents! Comical poem! Suitable for the occasion, extemporized and thought up before your very eyes! All right, 'ere we go! Bert: Room 'ere for everyone. Gather around. Bert: The constable - responstable! Now 'ow does that sound? Bert: 'Ello, Miss Lark, I've got one for you. Bert: Miss Lark... likes to walk... in the park... with Andrew! Bert: Ah, Mrs. Corry, a story for you. Bert: Your daughters were shorter than you - but they grew! Mary Poppins: We can't have them gallivanting up there like kangaroos, can we? Mary Poppins: [watching Bert, Albert, Jane, and Michael laugh together on the ceiling] Why, it's the most disgraceful sight I've ever seen, or my name isn't Mary Poppins. Bert: Speakin' o' names, I know a man with a wooden leg named Smith. Mr. Banks: [singing] With tuppence for paper and strings, you can have your own set of wings! With your feet on the ground you're a bird in flight, with your fist holding tight to the string of your kite! Oh, oh, oh, let's go fly a kite, up to the highest height! Let's go fly a kite, and send it soaring! Up through the atmosphere, up where the air is clear! Oh, let's go... fly a kite! Mr. Banks: Really? Well, that is extraordinary. Mrs. Banks: Oh, George, you didn't jump into the river. How sensible of you! Constable Jones: [into phone] It's all right, sir, he's been found! No, alive! Or so I presume, he's a-kissin' the Mrs. Banks. Mr. Banks: I've been sacked! Discharged! Flung into the street! Mr. Banks: A spoonful of sugar makes the medicine go down! Tra-la-laaa-lalalalala! Ellen: Gone off his crumpet, that's what he's done. Dotty as you please. George Banks: [singing] A man has dreams of walking with giants. To carve his niche in the edifice of time. Before the mortar of his seal has a chance to congeal... The cup is dashed from his lips! The flame is snuffed a-borning... He's brought to wrack and ruin in his prime. Mary Poppins: That's a piecrust promise. Easily made, easily broken.